Hi eYeka, Snacks are great! They are delicious and make us feel joyful. However, buying snacks is another story: imagine the cluttered and crowded supermarket shelf or the old and boring convenience store near your home where you usually go to for snacks. They don’t make snacks look or feel as delicious or joyful as they actually are. 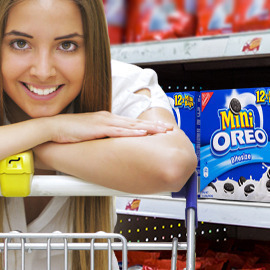 Now it’s your turn to make snack shopping as delicious and joyful as the snacks by designing a new store display that can be used by various snack brands (like CADBURY, OREO; etc.) to create a mouthwatering and convenient journey for shoppers. Format: Presentations with pictures or illustrations and text in no more than 6 slides (in PDF format).